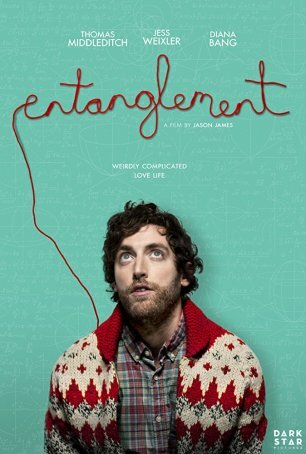 Entanglement takes some un-romantic concepts and cleverly uses them to form the skeleton of an appealing romantic comedy. With doses of magic realism (animated deer, jellyfish in a pool) providing icing on a cake assembled using layers of Jungian psychology and quantum mechanics, the movie goes in directions that are ambitious and unconventional. Entanglement isn’t without flaws – the ending would have been better served had one character been accorded more development and additional screen time – but this is as surprising a romantic comedy as I have seen in some time. The movie opens with a darkly comedic montage of failed suicide attempts. Ben (Thomas Middleditch), despondent over being deserted by his beloved wife, has decided to end it all, but his aptitude for self-destruction is limited. After asphyxiation, hanging, an overdose, and electrocution all fail, he has some success with wrist-slitting. However, while he’s lying in a bathtub bleeding out, he hears a knock at the door. Some compulsion causes him to answer and this action leads to his survival, although perhaps not his immediate salvation. Soon thereafter, Ben is trying to get his life together. He visits a therapist (Johannah Newmarch) regularly. His neighbor, Tabby (Diana Bang), keeps an eagle-eye on him and sneaks into his apartment to clean it. But he’s rudderless…until he learns from his father that he “almost” had a sister. Around the time of his conception, his parents were in the process of adopting a baby girl. However, on the day they were supposed to finalize the paperwork, Ben’s mother learned that she was pregnant, and regulations disallowed couples with a natural child from adopting. After gaining access to the adoption records, Ben tracks down his almost-sister, Hanna (Jess Weixler), and introduces himself. She and Ben hit it off immediately – her sassy, extroverted, carefree approach to life is exactly what he needs as a counterbalance and they’re soon applying principles of quantum physics to macro systems while shifting their relationship from platonic to sexual. Wikipedia describes quantum entanglement (from which the movie’s title is derived) as “a physical phenomenon that occurs when pairs or groups of particles are generated or interact in ways such that the quantum state of each particle cannot be described independently of the others.” The filmmakers take this seriously and apply “entanglement” to Ben and Hanna – two people whose lives have been connected from the beginning and whose existence depends on one another. They are the heads & tails of a coin – connected but in opposition. (The screenplay also toys with ideas like Heisenberg's uncertainty principle and the concept of infinite universes.) This allows for a few weighty philosophical discussions that aren’t as dense as one might suppose given the nature of the material. The filmmakers either have a reasonable understanding of quantum physics or have read enough to be able to fake it. Nice performances and effective chemistry are evident. Thomas Middleditch (one of the stars of HBO’s Silicon Valley) mostly plays the role straight, not trying too hard to get laughs and providing a strong dramatic turn when demanded by the script. Jess Weixler (whose performance in Teeth is gnawed into my memory) is lively and charismatic, with a vivacity that offsets Middleditch’s moroseness. It’s hard to say much about Diana Bang, who is underused. Entanglement is getting a limited U.S. release for Valentine’s Day 2018 (with on-demand availability for those not able to attend one of the small number of theaters in which it will play) and, despite its narrative hiccups, it’s a better bet than the high-profile Fifty Shades Freed. There’s a lot to like about Jason James’ indie romance, especially for those with a background in science, philosophy, or psychology. It’s offbeat and offers a breath of fresh air in a genre that too often is defined by stale tropes and unrelenting predictability.